Sera Mitchinson is a designer selling her clothes at the Titirangi markets and elsewhere under the label “Selector“. 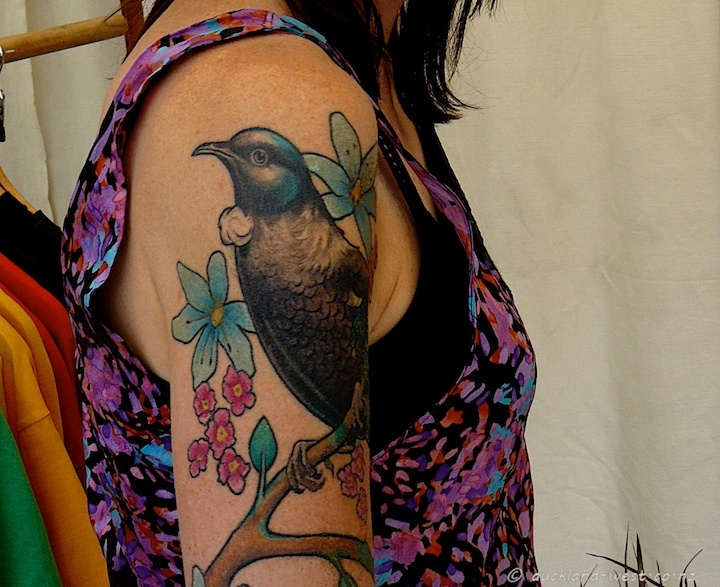 Here she poses with her body art, a delicately tattooed tui on a flowering branch. The tattoo artist is Peter Bauer, owner of Uptown Tattoo 175 Symonds St in Auckland (visit them on Facebook). The Passionvine Hoppers (Scolypopa Australis) are sap sucking insects and both their nymphal stages as well as the adults (shown) can create quite a mess with their secretions. They are a major pest for both passionfruit and kiwifruit, as the black fungus growing on the sugary ‘honeydew’ makes the fruit unmarketable. They are also unpopular in our garden. Length about 7-8 millimetres. 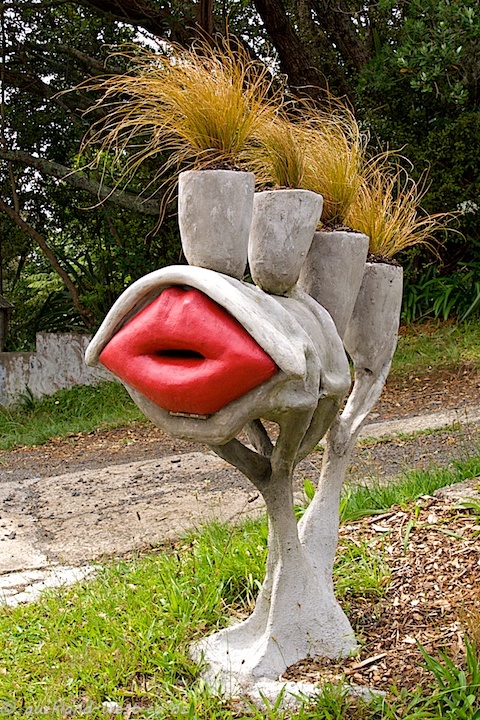 While the name might suggest that these critters are selective in their choice of host plant, they will in fact invade any plants with a good supply of sap. 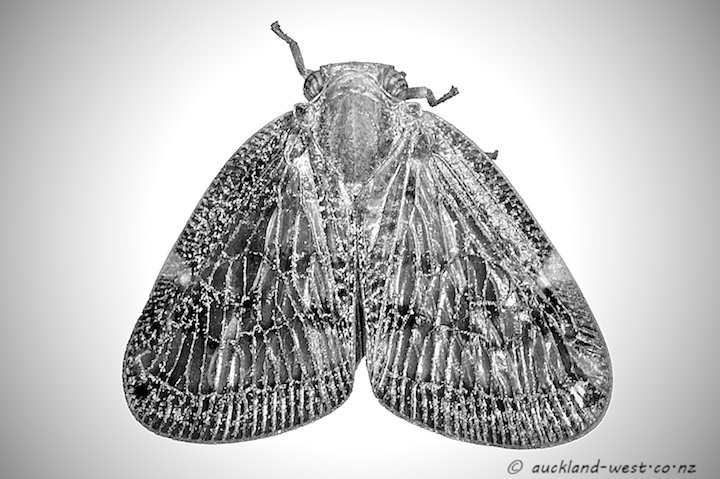 This is an image of a hopper sitting on our window, taken with flash, producing a black background. I am showing a negative. The tide is rising, and soon the birds will have to move. 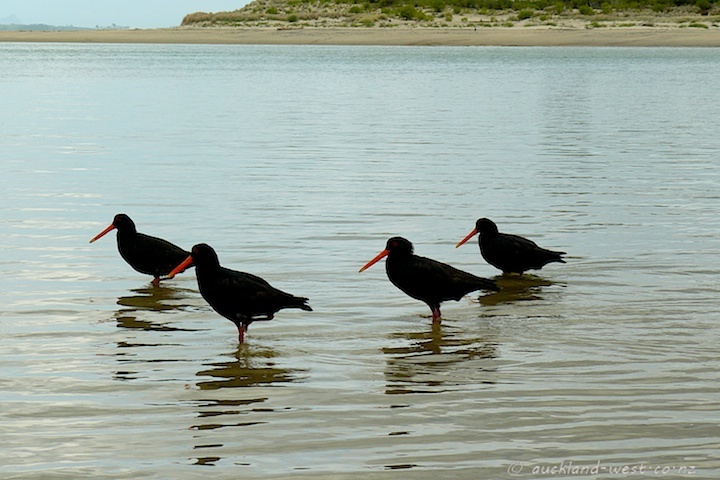 These are variable oystercatchers (Haematopus unicolor), a species occurring in New Zealand only. In the background the Ngunguru sandspit. Seen from our deck a few days ago. Wild ginger thrives in the shade of the bush, but it is a serious weed, forming thick mattes of rhizomes and suffocating all other plant life. Birds spread the seeds widely. 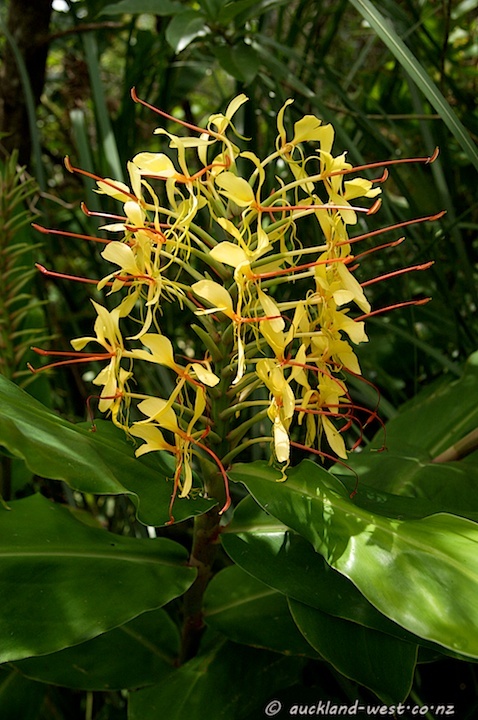 From the Landcare Research website: Wild ginger (Hedychium gardnerianum), also known as Kahili ginger, was originally grown in New Zealand as a garden plant. It was first found in the wild in the 1940s, and is now a serious weed in native bush, forming dense stands that smother plants and prevent native seedling regeneration. The weed is most troublesome in North Island forests and the warm northern regions of the South Island. It is equally destructive in Hawaii, where it has invaded native Hawaiian rain forests. 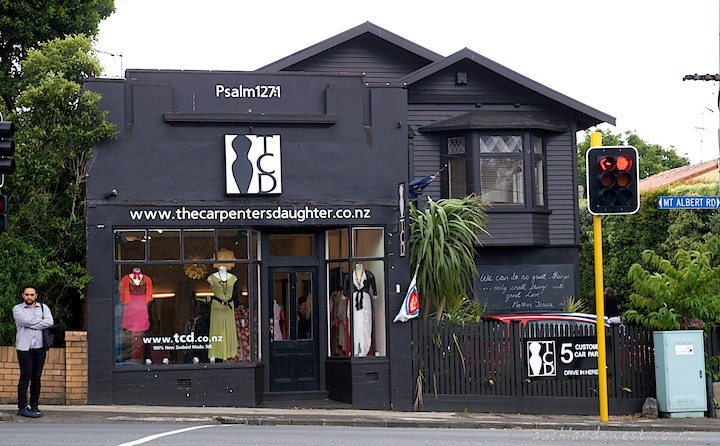 I had just left the TSB Bank Wallace Arts Centre, pondering the possible meaning of “Matthew 12/12” (see the day before yesterday), when down the road at the intersection of Hillsborough and Mt Albert Roads I was confronted by a new puzzle: “Psalm 127:1“. This distinctive house is a shop peddling “Sassy Clothing for Curvy Girls“. Their “About Us” page says: “Founder Caroline Marr is The Carpenters Daughter, and continues to lead the Company as Creative Director. Caroline is committed to encouraging curvy girls to be the best they can be…welcome to her wardrobe…” They seem to be very successful and even participated in New Zealand Fashion Week. And Caroline Marr is in fact the daughter of a carpenter. 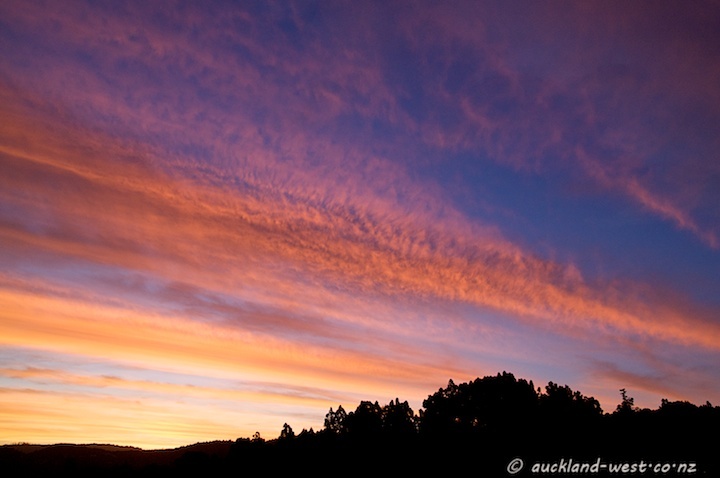 Stores in Takapuna, Hamilton, Tauranga, Wellington and Christchurch. We went to celebrate the impending arrival of the year of the rabbit with the Auckland Chinese Community Centre at the ASB Showgrounds last Saturday. They did their best to help me into enduring poverty with everything that might bring me good fortune, not to mention the delicious foods and free displays of martial arts, dragon dances and more. 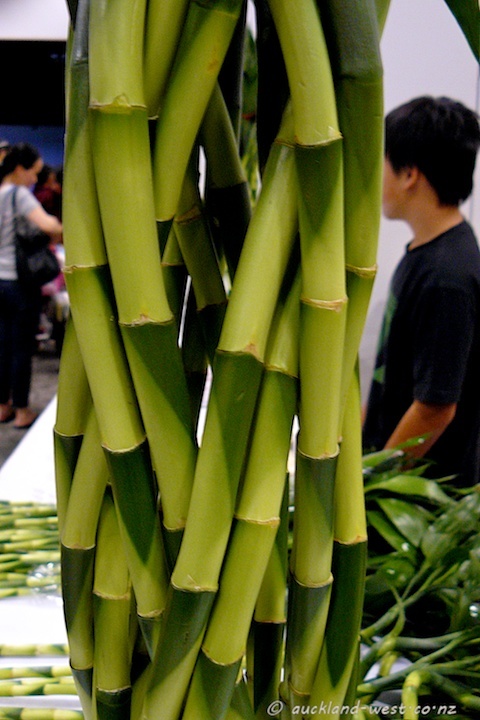 They also sold lucky bamboo of various types. 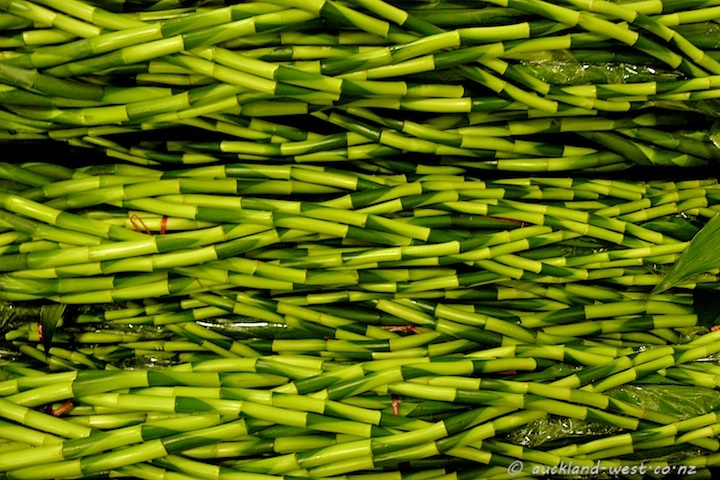 Above is a closeup of an artfully woven cylindrical bundle of straight stems. You have to like the patterns and shades of green! And comes with abundant feng shui. Of course, like many names, this one is misleading (I am talking about the bamboo part, don’t know anything about luck…). The plant (Dracaena sanderiana) is not related to bamboo at all, but a member of the lily family, originating from the rain forests of south east asia. Always eager to celebrate something, it turns out that we jumped the gun (ever so slightly): the year of the rabbit begins on February 3, 2011 and ends on January 22, 2012. But I won’t hold it against the organisers. What we see goes as two titles at the TSB Bank Wallace Arts Centre: 72 items entitled “Matthew 12/12” and one entitled “Dog” — ceramics by Gregor Kregar, an artist who works in Auckland and Berlin. (In case you need help with cryptic biblical quotes: “How much then is a man better than a sheep?”) The colourfully attired sheep also appeared in various places (among them A&P shows) as an installation of 12 live sheep in knitted wollen jumpers inside a picket-fence pen. Gregor Kregar is represented by Gow Langsford Gallery, Auckland. Check out the gallery website and the artist’s personal website for an overview of his wideranging work. 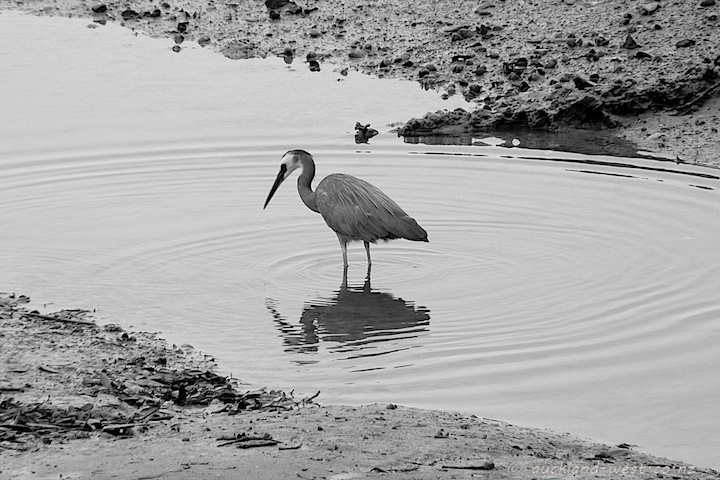 A white-faced heron (Ardea novaehollandiae) reflects on lunch. These birds are quite common along shorelines and in wetlands.